For one of the world's best ever ski jumpers, Matti Nykanen, life has not been all a bed of roses. Although a fragile youngster, Nykanen was clearly a prodigy from the moment he took his first jumps on the hill in his home town of Jyvaeskylae. Finnish junior champion at 16, world junior champion at 17, large hill senior world champion at 18: he was irresistible. In 1983 he won the prestigious Four Hills championship, confirming his exceptional ability. 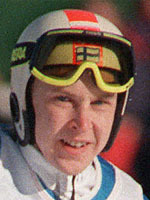 At Calgary in 1988 Nykanen became the first jumper to win three gold medals in a single Olympic competition when he destroyed the opposition in the large and normal hills before helping Finland to the team title. But the broiling nature concealed behind that curiously emotionless facade soon began to take its toll on himself and others. His mentor and boss Matti Pulli was forced into the draconian decision of removing his greatest jumper from the Finnish national team because of his erratic behaviour. In 1987 his marriage to Finnish model Tiina and the birth of their son steadied the lurching ship to a certain degree, but his waywardness often got the better of him. It was clear that he had a problem with alcohol and it was alleged that other substances also passed his way. He won several more World Cup events to establish a record total of 46 victories, before things went rapidly downhill. In 1991 his federation withdrew all financial support in the build-up to the Albertville Games because the Finn was no longer making the grade on the hills. Three failed marriages and a pop career that never really got off the ground, he found himself working in bars to combat his huge debts. According to some rumours he even sold his championship medals, an allegation he strictly denies. His career ended with a whimper when he could only manage 50th place at the 1991 world championships at Val di Fiemme, a failure whose pathos was accentuated by memories of the truly brilliant jumper Matti Nykanen had once been. The downward spiral continued when he picked up a four month suspended prison sentence for beating his fifth wife Mervi Tapola who he had married for the second time and in March 2004 he finally went behind bars after stabbing a friend in a drunken frenzy in October of the same year. He was sentenced to 26 months in jail for attempted murder although prosecutors pursued a longer penalty. Shockingly just one week after getting out of prison in September 2005 he was back at the police station answering questions on the beating of his wife while once again being under the influence of booze.